Please tell us about UMSC’s operations in Malaysia. UMSC has been in existence since 1999. 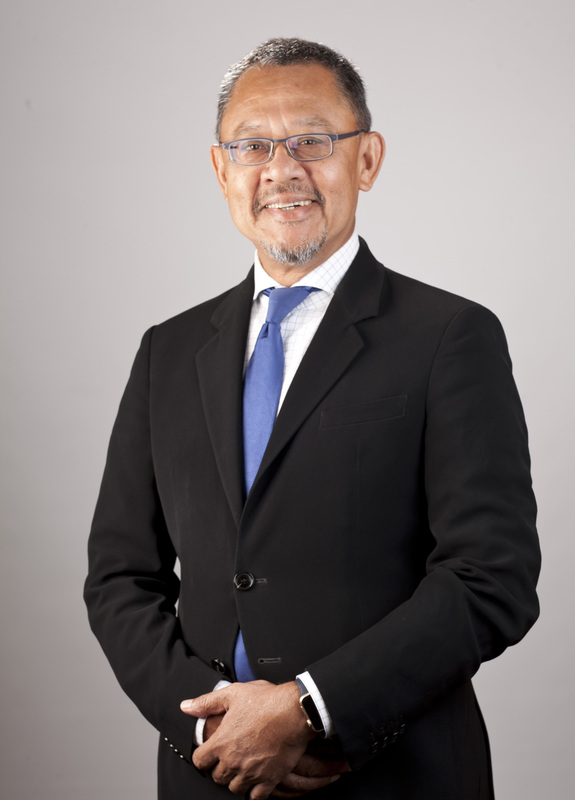 It was initially established as an initiative by University of Malaya and the Faculty of Medicine of the university to halt the brain drain of medical experts from the public sector to the private. Academic clinicians were allowed to carry out private practice on a sessional basis within the umbrella of the university. Today UMSC consists of over 240 experts across all specialities. Our specialists are not just specialised, but most of them are super- or sub-specialised. Therefore, a speciality like orthopaedics surgery will include hand surgeons, joint specialist, spine surgeons, orthopaedic oncology surgeons, paediatric orthopaedic surgeons, and even foot and ankle specialists. Neurosurgery today in UMSC comprise subspecialities of paediatrics, oncology, radiosurgery, epilepsy, functional (movement disorders like Parkinson’s disease), vascular and cranial base surgery. What are some of UMSC’s recent initiatives, innovations, and strategies? Given the depth and width of our existing expertise, our endeavour is to position UMSC as a ‘Hospital of Hospitals.’ This concept actually works in two prongs; the first point and the most obvious is given the number of sub-specialities within any given speciality; it is possible to form a specialised hospital for each major speciality. Hence, today we are fundamentally a congregation of diverse specialised hospitals. The second and perhaps a less obvious take is that the public wing of the university is the oldest teaching hospital in the country having recently celebrated its 50th anniversary. Since inception, UMMC (the public wing) has provided the final port of call to patients with complex problems that may not have a solution elsewhere. This is possible because the ecosystem provides the widest range of specialities with cutting-edge medical equipment to match. UMSC today exists in the very same environment, with the exception of providing private services utilising the same medical expertise and equipment. How much is UMMC’s involvement in UMSC? The relationship between UMMC with UMSC is symbiotic in nature. UMSC works closely with UMMC, especially in the use of its facilities like imaging suites, theatres, and lab services. Excess capacity within the system is utilised by UMSC to provide its services. In return, UMSC pays UMMC various fees for rental of space and utilisation of services. This money is used to supplement government allocations to upgrade and maintain services within UMMC, ensuring that all patients (both public and private) continue to enjoy the high-end facilities that are provided. Correspondingly, there are also sound benefits for UMMC staff, as UMSC provides the avenue for them to earn extra by providing locum services after their obligatory working hours, instead of seeking to work elsewhere, if they choose to. The close collaboration between UMSC and UMMC equally allows a variety of complex cases to be discussed at length with a larger body of experts to prudently decide a suitable management plan formulated for individual patients. These experts come from a cross section of specialities to form multi-disciplinary management teams (MDT), ensuring that patients get the best plan based on science for their problem. What are your future plans for UMSC? We are hoping to have a new wing soon specifically for UMSC comprising purpose-built private wards and clinics. This is to ensure that patients receive the “private patient experience” that most private patients would anticipate in terms of a ‘pleasant patient journey’. We, however, will continue to link this facility to UMMC to ensure the high end services remain accessible and benefit both the private and public patients. 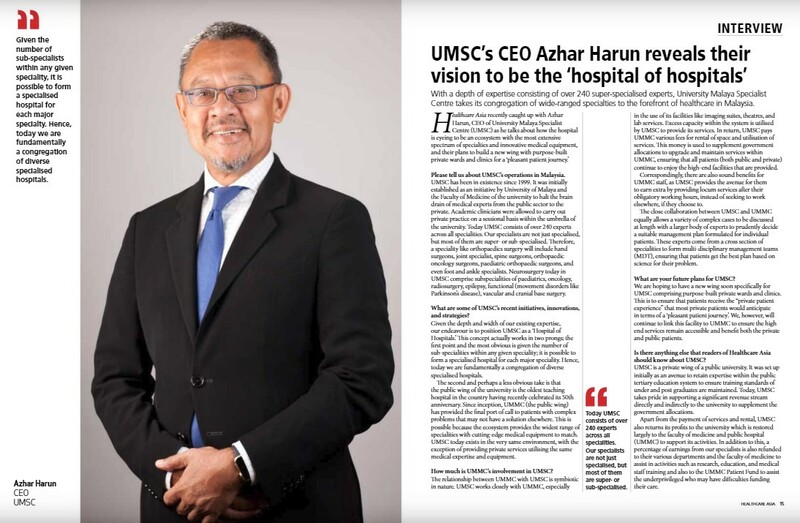 Is there anything else that readers of Healthcare Asia should know about UMSC? UMSC is a private wing of a public university. It was set up initially as an avenue to retain expertise within the public tertiary education system to ensure training standards of under and post graduates are maintained. Today, UMSC takes pride in supporting a significant revenue stream directly and indirectly to the university to supplement the government allocations. Apart from the payment of services and rental, UMSC also returns its profits to the university which is restored largely to the faculty of medicine and public hospital (UMMC) to support its activities. In addition to this, a percentage of earnings from our specialists is also refunded to their various departments and the faculty of medicine to assist in activities such as research, education, and medical staff training and also to the UMMC Patient Fund to assist the underprivileged who may have difficulties funding their care.